Velas Vallarta in Puerto Vallarta now offers guests live glass blowing during its weekly Mexican fiesta celebration. Local Mexican glassmiths Luis Rosas Rivas and Juan Carlos Balseca Rivas blow and paint (respectively) the glass figurines, also available for purchase. The offering is another example of Velas Resorts’ commitment to showcasing the local art and fashion of Mexico, which also includes past exhibitions from Rosana Sanchez, Benito Santos, Melin Castro, Hoja Verde, Lyne Jewels, Alejandro Carlín, Juan Barba, Ricardo Duarte Mendez and Martha Collignon. 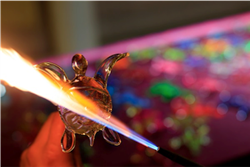 Glass blowing is a centuries old tradition to the Mexican culture. The very first glass made in North America was produced in Puebla, Mexico around 1535 to 1542 by artisans brought by the Spanish. Although these original glass works were short lived, glass blowing was reintroduced to Mexico hundreds of years ago and flourished due to the ingenuity of the Mexican arts and crafts tradition. Every Sunday, the Mexican fiesta at Velas Vallarta features live music by a mariachi band and Mexican folk dancers, traditional Mexican cuisine and local artisans displaying their work during the event. Nightly rates at Velas Vallarta start at $153 per person per night, based on double occupancy. All-inclusive rates include suite accommodations, a la carte gourmet meals at a variety of specialty restaurants, premium branded beverages, 24-hour in-suite service, fitness center, taxes, gratuity and more. For reservations or more information, please call 1-888-407-4869 or visit http://www.velasvallarta.com. Velas Vallarta is an all-inclusive family resort located on 10 acres of oceanfront with lush gardens in Puerto Vallarta, walking distance of Marina Vallarta Golf Course and just minutes from downtown Puerto Vallarta. Situated on the emerald waters of Banderas Bay, Velas Vallarta features 345 suites in three eight-story buildings, a high-tech Convention Center that can accommodate up to 700 people, three swimming pools, a rejuvenating spa along with spa cabins seaside, fitness center, multiple restaurants, and an inviting lounge with live music. Nightly theme dinners and local specialties are sure to please even the most discerning palate, and room service is available around the clock. When it comes to daytime and evening entertainment, guests can choose from an exciting and original array of activities and events, from making piñatas and jewelry, yoga on the jetty to Mexican fiestas and casino nights. The recently renovated Kids' Club also welcomes children under 13 with supervised activities like treasure hunt, face painting, sand castles to crafting with beads, allowing parents to indulge in a choice of exciting or relaxing pursuits like a game of golf, a variety of excursions or pampering at the spa. In addition, the resort was one of the first in the destination with a Green Globe certification, dating back to 2008. Puerto Vallarta features championship golf courses, world-class spas and magnificent beaches, not to mention various sports and activities up in the Sierra Madre Mountains. The possibilities for rest and relaxation, or fun and excitement, are endless. Velas Vallarta was built and is operated by Eduardo Vela Ruiz, owner, founder and president of Velas Resorts, with brother Juan Vela by his side, vice president of Velas Resorts.